The riveting #1 bestseller from Austria: the story of an undertaker—a “vengeance goddess” with a dark past—who makes a vow to hunt down her husband’s murderers. Blum is a mortician—an outspoken woman in a male dominated profession. She is also the loving mother of two young children, adored by those around her for her kind heart, her strength, and her sharp wit. Blum rides a motorcycle, and likes to spend time with friends and her husband, Mark, a policeman. She has been happily married to Mark for eight years, a perfect union. Blum has a good life—a life that masks the terrible secrets of her childhood. Then, in one devastating moment, Mark is killed before Blum’s eyes. A hit-and-run. The most important thing in her life, her support and happiness, is taken from her. Blum grieves, but she refuses to accept her fate. She soon discovers that there is more to Mark’s death than meets the eye. This was no accident. A shadowy group of people wanted Mark dead. But why? Blum is determined to find out—and to have her revenge. Woman of the Dead, the first book in a trilogy, is an unforgettable thriller about the lengths one passionate woman will go to for vengeance, and about the tug of war between good and evil in all of us. 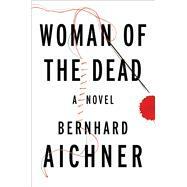 Writing with breakneck narration and rapid-fire dialogue, Bernhard Aichner is poised to follow in the steps of Jo Nesbo, Camilla Läckberg, and Jussi Adler-Olsen to become Europe’s new breakout star in crime fiction.